Next Article Click … ‘Kaboom’. That’s It. VOICES - Billionaire shopping center developer, Rick Caruso, has proposed that the block-long, fixed rail trolley line at the Farmers Market / Grove shopping center in LA’s Beverly-Fairfax neighborhood be expanded. He would like to connect it to the Los Angeles County Museum of Art via Fairfax Avenue and to Beverly Center shopping center via Third Street. While the precise details, if they even exist, have not yet been made public, the estimated cost of this expanded trolley line is $70 – 80 million. Mr. Caruso also stated that his company is willing to pay an unspecified portion of these costs. As a city planner who has lived in the Farmers Market / Grove neighborhood since the 1970’s, and who serves on the Beverly Wilshire Homes Association board, here are some initial comments about these proposed trolley lines. First, Third Street and Fairfax Avenue could become great streets, but their priorities are not a trolley line. They need smooth, wide, well landscaped sidewalks with enhanced street lights, street furniture, and ADA curb cuts – just like The Grove. They need a large, beautiful tree canopy for shade, not just small ornamental trees. They need their ugly billboards removed and their unsightly overhead power lines undergrounded. Furthermore, the City of Los Angeles must stop issuing variances, zone changes, and conditional use permits for stores and restaurants that do not have code-required parking. Second, after The Grove extends its outstanding walking environment into adjacent streets, it can move on to an expanded trolley line, and it will take some serious study, including a detailed Environmental Impact Report. Will the trolley system be fixed rail, powered through overhead electric wires? If it is a fixed rail transit system, who will pay for it, and will the local transit authority, METRO, operate it? Where will the stations be located, and will riders run through busy traffic, like they do for San Francisco’s cable cars, to get on board? 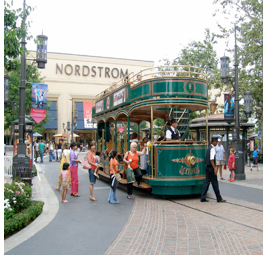 Most importantly, how will the trolley lines be retrofitted into highly congested streets filled to capacity with shoppers busy driving to The Grove and the adjacent Farmers Market? Would a fixed rail trolley line on busy Los Angeles city streets be viable? The last Red Car trolleys were pulled off the streets of Los Angeles in the early 1960's, largely because they could no longer operate on LA’s traffic-clogged roads. At that point their alignments needed to be undergrounded or grade-separated. Since the City’s elected officials were car-happy, neither option happened, and the old trolley system folded. The tracks were pulled up or paved over. Some cars were sold off, and others were dumped into the ocean near Long Beach. This is why the Los Angeles region's elaborate mass transit plans now focus on buses and separate rail corridors. While no professional transportation engineers or city planners call for the restoration of the Red Cars, they do agree that Los Angeles needs far more transit, including light rail (Blue, Gold, and Expo lines), heavy rail (Red and Purple line subways), Bus Rapid Transit (BRT) on dedicated bus lanes, inter-urban commuter rail, inter-urban high speed rail, local buses, express buses, and jitneys. Does the Grove have any obligation to mitigate its traffic? Yes, through its maze of building permits, special zoning approvals, and conditions from its Final Environmental Impact Report, The Grove is legally obligated to fund mitigation programs to alleviate its enormous traffic impacts. While it is truly welcome that Mr. Caruso now wants to contribute more funds to, in effect, expand these mitigation programs, the traffic congestion in the Fairfax area related to The Grove should be dealt with comprehensively. Any new programs should address the complicated land use and transportation issues of both nearby neighborhoods and the city as a whole. This is a completely different approach than an expensive but isolated proposal that would, nevertheless, require vast technical studies and environmental reviews. So far The Grove has contributed $400,000 to the Neighborhood Traffic Mitigation Fund required by its multiple conditions of approval. Most of this money has already been spent on speed bumps and a few landscaped median strips. Given the magnitude of The Grove’s traffic impacts, these local street improvements have hardly made a dent in local traffic congestion. Much more mitigation is needed, and given The Grove’s extraordinary success, it can now obviously afford to ramp up its contributions. Let’s hope, therefore, that the tens of millions that The Grove is now offering for the trolley will, instead, be integrated into the city’s transportation improvement programs. Is the City of Los Angeles undertaking comprehensive transportation planning that applies to the Fairfax area? Luckily the City of Los Angeles is undertaking those comprehensive transportation studies for its new Mobility Element. Furthermore, this planning process complies with a new State of California law called the Complete Streets Act (AB 1358). First, the Fairfax area already has a basic LADOT Dash line, and it would be wonderful if The Grove would upgrade it by adding new lines on Third and on Fairfax, as well as increasing headways (frequency of service) to 5 minutes, (just like subways in New York City). If the Grove covered the fares, like it does for its on-site trolley, that would be even better, and ridership would soar. Another closely related option is the resurrection of the Fairfax Trolley bus that operated about one decade ago, but met its demise because of inadequate funding. Second, there already is a METRO Express bus line on Fairfax Avenue, where The Grove is located, but more frequent and reliable bus service would help address local traffic congestion. There is, however, only local METRO bus service on Third Street, so either more frequent service and/or an Express line could also reduce local traffic congestion related to The Grove. Third, because all of the destinations under discussion (Grove, Farmers Market, Museums, Beverly Center, Beverly Connection, Cedars, Pacific Design Center) are close to each other, other inexpensive and easy fixes are improving the local bicycle infrastructure and pedestrian environment. These are integral to the new Mobility Element and are mandated by California’s Complete Streets Act, so why not move on them now? What about pedestrian improvements? In particular, the Fairfax area is totally flat and perfectly suited for walking. There already is a working Complete Streets model at The Grove itself and a mile to the north on Santa Monica Boulevard in West Hollywood, where the sidewalks and street went through a complete makeover. The Grove can easily promote pedestrian activity -- something it excels at -- on Third Street and on Fairfax Avenue by funding legally required ADA curb cuts, street furniture, improved street lighting, extensive sidewalk repairs, and a proper tree canopy like other nearby cities, such as West Hollywood, Beverly Hills, and Culver City. These upgraded Third Street and Fairfax walking environments would also benefit from the removal of ugly signage, especially supergraphics and billboards, along with the elimination of land uses that deter walking, such as automotive body shops. Since Mr. Caruso totally controls the visual environment and land uses within The Grove, why not offer these same amenities to the nearby commercial corridors suffering from The Grove’s traffic? What approach is most cost effective? Complete Streets improvements cost about $5 million per mile, which is much cheaper than the estimated $70-80 million cost to construct the Caruso trolley, and an unknown amount for its engineering studies, multiple permits, Environmental Impact Report, and long-term operating costs. We also need to consider the costs of liability insurance since a fixed rail trolley on busy streets will be plagued by car accidents and pedestrian fatalities. What can we learn from other cities? New York City recently opened a fabulously successful bike-sharing program funded by Citibank. The city even branded the program Citi-bike. To be consistent with the Mobility Element, the makeover of the streets radiating out from The Grove should incorporate bicycle friendly features, so why not give the naming rights to Mr. Caruso? New York can have Citi-bike, and we can have Caruso-bike in Los Angeles. Furthermore, if we upgrade bicycle parking on these streets and especially at The Grove, Farmers Market, and other local commercial destination, the Fairfax area could easily follow the example of New York City, as well as smaller cities, such as Portland, Minneapolis, Vancouver, and Tucson. Conclusion? Let’s salute Mr. Caruso for his willingness to increase The Grove’s traffic mitigation funding from $400,000 to as much as $80 million. But, let’s also remind him that the surrounding neighborhoods absolutely deserve The Grove’s most positive and successful feature, a delightful walking environment. If Mr. Caruso commits himself to this least costly approach, he will have found a solution that will benefit The Grove, as well as nearby commercial corridors and destinations, such as Wilshire Boulevard’s museums. He will also repair his relationship with The Grove’s neighbors since they have endured a decade of horrendous traffic while The Grove helped make Mr. Caruso a billionaire.